Nissan has really embraced the SUV/CUV craze, offering no less than six SUV/CUVs, ranging from small (Nissan Kicks) to the very large (Nissan Armada). We recently had a chance to review one of their small-ish CUVs, the 2019 Nissan Rogue, which is bigger than the Kicks and Qashqai and smaller than the other three crossovers they offer. I don’t know exactly how many Rogues Nissan sells, but I see these everywhere (upon further investigation, the Rogue is Nissan’s top selling model, so everything I say in this paragraph makes complete sense). The street outside my house has room for nine cars, and there are usually three Nissan Rogues parked there. I see these cars in the malls, movie theaters, restaurants, and everywhere in between. The Nissan Rogue is like the Civic of crossovers. In Canada, the 2019 Nissan Rogue is offered in three trims. The base is called the Rogue S and has a starting price of $26,798, the next trim up is the Rogue SV with a starting price of $29,098, and the top of the line is the Rogue SL Platinum (with ProPILOT assist), which starts at $37,398. Our test car for the week was the 2019 Nissan Rogue SL Platinum AWD, with a total price tag of $39,993, before taxes and other fees. This price included $800 worth of options, $500 for the “Reserve Interior” (which includes tan leather seats and quilted leather seat inserts), and $300 for 3-coat paint, and $1,795 for Freight & PDE. All three trims of the 2019 Nissan Rogue are equipped with 2.5-liter 4-cylinder engines, producing 170 horsepower at 6,000 rpm and 175 pound-feet of torque at 4,400 rpm. Power is sent to the front wheels on the S and SV trims (AWD is optional) and all four wheels on the SL Platinum trim via the Xtronic Continuously Variable Transmission. According to Nissan, the AWD SL Platinum should consume 9.6 L/100 km in the city and 7.5 L/100 km on the highway. The onboard computer showed 7.7 L/100 km in 60/40 highway/city driving, with my smooth driving style, your mileage may vary depending on your driving style and driving conditions. Driving the Rogue is a pretty good experience, it’s a family crossover, so it drives like it should. The 170 HP is enough for city driving and highway acceleration and passing is not a problem. The CVT isn’t as crisp as my favorite CVT so far, which belongs to the Nissan Maxima, but it’s not too bad. Under heavy acceleration, the engine does get buzzy and you do feel the CVT-ness of the CVT. The Rogue does come with and “Eco” and “Sport” mode, which I didn’t even bother with, these buttons are placed to the left of the steering column, out of the way. I personally would’ve preferred these buttons to be placed somewhere more easily accessible, I’ve never seen these types of buttons placed so out of the way. We didn’t really have wintery conditions to test the AWD system, so I can’t really comment on that. But with a proper set of winter tires, the Rogue should be able to handle snowy Canadian winters, based on what I’ve seen in Nissan commercials. Our test vehicle was equipped with the ProPILOT ASSIST, which is Nissan’s semi-autonomous driving system. I really liked this system on the Infiniti QX50 that we test drove a little while ago, and I like it a lot on the Rogue, it works great and feels almost natural, unlike some systems where the car hits the brakes hard when it sees the car ahead slow down. The ProPILOT ASSIST decelerates very smoothly and feels almost natural. Styling is a matter of personal preference and when it comes to SUV/CUVs, most of these vehicles look similar. I think the Rogue is a pretty good looking crossover, especially in the 3-coat white paint our test car was painted in. The design is similar to other SUV/CUVs Nissan has for sale, which is especially apparent in the front end of the Rogue, it has a strong family resemblance to other vehicles in the Nissan lineup, with its V-Motion front grill. The interior on the 2019 Nissan Rogue SV Platinum is nicely appointed. The look of the interior, especially with the brown/tan leather (which is part of the $500 Reserve package, well worth the price), is almost entry level luxury. There’s a mixture of soft and hard plastics on the dashboard and the surrounding areas. The layout is easy to understand, and all the controls are very easy to reach, it didn’t take me much time to get used to the layout. The 7” infotainment screen has crisp graphics and is a decent size, I think a little larger screen would be more appropriate to go with the size of the cabin. Below the screen is a separate small area for the climate control; personally, I prefer it this way, as I don’t have to fiddle around with the infotainment screen to get to the climate control section. What isn’t in a convenient location, as I mentioned in the driving section, is the placement for the heated steering wheel button, which is located next to the “Sport” and “Eco” button to the left of the steering column. I would’ve liked these buttons to be in a more visible spot, as I didn’t even know, for the first few days, our Rogue came with a heated steering because I didn’t see the button. The interior on the Rogue is very roomy, it’s perfect for families or people that need to haul a bunch of stuff, that’s why it’s so popular. Front and rear occupants have more than enough leg and head room and there’s a big trunk at the back, with can be expanded further with the rear folding seats. The rear cargo room is 1,112 liters with the rear seats up and 1,982 liters with the rear seats folded. As you can see from the list above, the 2019 Nissan Rogue can be equipped with a lot of goodies, the above list is for the top of the line trim, lower trims don’t necessarily have all the features available, some are optional and some not available at all, depending on trim. There’s a reason the Rogue is Nissan’s best selling vehicle, it’s a great vehicle that ticks all the boxes and it doesn’t hurt that the SUV/CUV craze is in full bloom right now. 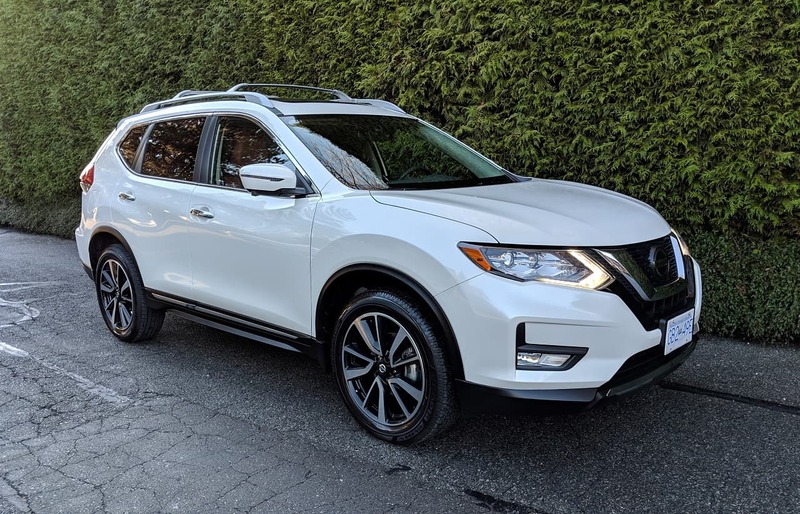 The 2019 Nissan Rogue is pretty luxurious on the inside, it has a lot of room for families, and it’s actually pretty frugal on fuel; a great combination for people looking for something a little larger than a sedan without sacrificing fuel efficiency.